Key practice: Control weeds early through a combination of pre-seed weed control and one in-crop application before the four-leaf stage. Key research: Harker, K. Neil, Agriculture and Agri-Food Canada (AAFC), et al. “Field-Scale Time of Weed Removal in Canola.” Weed Technology (2008). Harker, K. Neil, AAFC, et al. “Seeding Rate, Herbicide Timing and Competitive Hybrids Contribute to Integrated Weed Management in Canola (Brassica napus).” Canadian Journal of Plant Science (2002). Canola in the seedling stage is a poor competitor against weeds. A combination of a pre-seed burn-off treatment and in-crop herbicide application prior to the four-leaf stage will have greater yield benefits than controlling weeds later in the season. University of Saskatchewan research shows that, in terms of yield, early weed control is even more beneficial than early seeding. Although this particular study was conducted on wheat, lead researcher Ken Sapsford says results would be similar for canola. When averaged across all site years in Sapsford’s study, early herbicide application, regardless of seeding date, resulted in eight percent higher yields than the combination of late herbicide application with late seeding. “Field-Scale Time of Weed Removal in Canola,” published by Neil Harker et al, discusses the findings of small-plot experiments conducted in 10 Western Canadian canola fields over two years. Each location was seeded with imidazolinone-resistant (IR) canola and treated with a commercial mixture of imazamox and imazethapyr in 10 gal./ac. of water at the 1- to 2-leaf stage, 3- to 5-leaf stage, and 6- to 7-leaf stage with a field sprayer. Average canola yields across all site years were 2,073 kg/ha (37 bu./ac.) when treated at the 1- to 2-leaf stage, 1,872 kg/ha (34 bu./ac.) when treated at the 3- to 5-leaf stage, and 1,650 kg/ha (30 bu./ac.) at the 6- to 7-leaf stage. Early weed control means higher canola yield. This graph is based on results in Neil Harker’s paper, “Field-Scale Time of Weed Removal in Canola.” Weed Technology (2008). Harker concluded that canola growers are well advised to ensure weed removal at relatively early growth stages. Delaying weed removal until the 6- to 7-leaf stage reduced canola yields in this study by 20 percent. In “Seeding Rate, Herbicide Timing and Competitive Hybrids Contribute to Integrated Weed Management in Canola (Brassica napus),” Harker outlines the findings of a three-year study funded by the Alberta Canola Producers Commission. 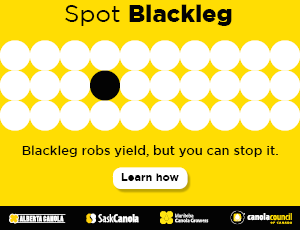 Field experiments conducted at Lacombe and Lethbridge analyzed various cultivars, seeding rates and timing of weed removal to determine the optimal combinations with respect to canola yield and quality. Hybrid and open-pollinated canola cultivars were seeded at rates of 100, 150 and 200 seeds per square metre (or about 10, 15 and 20 per square foot). Both cultivars received the same seed treatments with weed removal timings at the 2-, 4- or 6-leaf stage of canola. 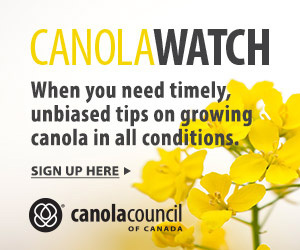 Over all sites, yield was reduced by four percent when weed removal was delayed until the 6-leaf stage of canola. This is consistent with previous studies that show higher yields after early weed removal. The combination of high seeding rate and early weed removal resulted in yield increases of up to 41 percent in this study. “Managing these factors at optimal levels may help increase net returns, reduce herbicide dependence and favour the adoption of more integrated weed management systems,” Harker concluded.